Yarmouth Model Works had their two latest steel boxcars as well as plenty of photo etched parts that I purchased for my stash. It sounds like new items are planned for RPM Chicagoland and we talked about a proposed project I will do for him. Speedwitch Media had new decals, and a preview of their new book by Steve Hile on Union Tank Cars. A consequences of Kadee producing the early PS-1 is two new running boards—Morton and Gypsum, several new doors and more fabulous brake wheels. Kadee’s Sam Clark had a twinkle in his eyes as he showed people the Klasing wheel part, complete with a rim interior featuring curved areas for fingers. I called Sam the week before the event and to see if I could get some tank car parts. These are not in their catalog but he was able to bring me three full platforms—these are a one piece molding— and three running boards. 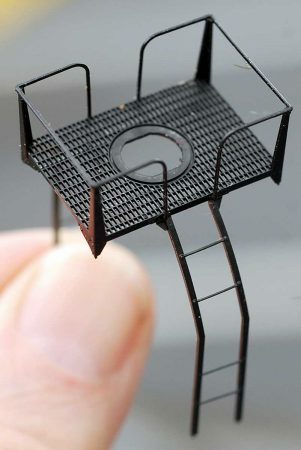 I want to try to use these to improve a couple of Atlas tank cars. 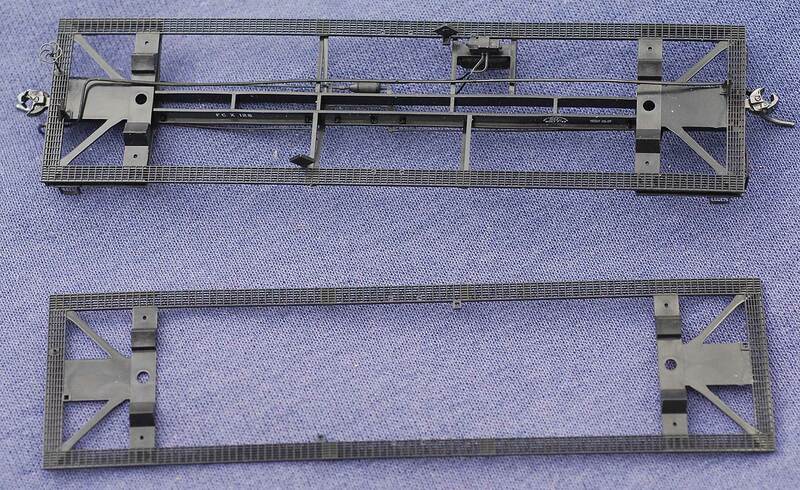 One of the running boards had an underframe attached, an unexpected bonus. Funaro & Camerlengo was not there but one of their dealers attended. I was able to finally look at and purchase their kit #8203, a Pennsy X26 USRA 50-ton single-sheathed boxcar model. Why buy this one instead of Tichy or Westerfield you ask? This is a rebuild of sorts, still wood sheathed but with either Creco or spliced Car Builders doors and a Hutchins roof. Additionally they have “booties” on some of their steel braces to compensate for the rust that often compromised them—very neat. They have other versions of these cars with ladders and/or with Youngstown doors. Photos of these refurbished cars are seen on pages 29-31 of Railway Prototype Cyclopedia, Volume 17. The white resin makes photographing these difficult but maybe you can see enough to interest you. I have already started building but no more photos until it is primed. 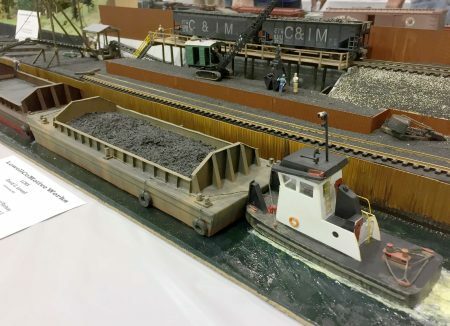 David Lowell’s C&IM coal transfer display at the St. Louis RPM. 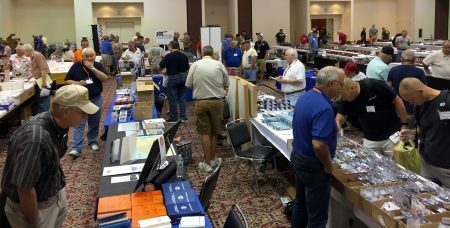 I was able to attend the St. Louis RPM this year. It was the first time for me. The event had a little different vibe that the usual RPM meets. St Louis seemed more like a summer camp experience to me with a relaxed attitude focused on the model displays and encouraging face-to-face discussions. Many RPM meets focus on the clinics and presentations, which seem more like an academic conference. The St. Louis event was a nice change of pace for me and fit the summer season. I most enjoyed spending time with modelers I don’t get to see often and meeting new people. There were more vendors and manufcaturer’s attending this event than any other RPM I’ve attended. it was very impressive and encouraging to see the support for prototype modeling. Of course, my wallet was thinner after the event. I brought home a few kits to build and purchased a few photos from the mid-1920s that were filled with freight cars. I hope this report encourages you to attend an RPM meet. Check the RPM event calendar for details on upcoming events around the country and in Canada. Here are links to a few St. Louis RPM photo galleries to encourage you to attend the next St. Louis event, or another RPM closer to home. Thanks for visiting the Resin Car Works blog! 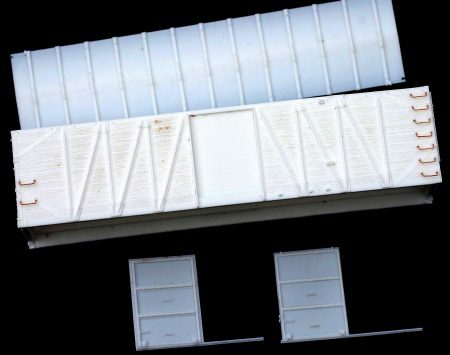 Does Bill do anything to the lower door track on his X26? Tune in at, hopefully soon, to find out! Thanks for posting. I had reservations made to be there, and had to change plans due to repairs needed to my Explorer. I couldn’t come until it was fixed, and spent much more on repairs than the trip would have cost. But there’s next year! Thanks for sharing the photo links. I’m passing them on to inspire members of Model Railroads of Southern California.